Spotted an awesome ‘very’ hi-res image of the Curiosity Rover on Mars on Facebook last week, downloaded it and set it aside to do some Photoshop trickery on it. Here’s what I came up with, a movie poster effect with Aliens V’s Curiosity! I first imported the 4 Alien pics and cut them out of their background using the Magic Wand tool. Next I dragged them to the main Curiosity pic and played around with locations that best suited their lighting, shape, size and angle. I then used the Free Transform tool to resize them. Next, I selected each Alien in turn and added both Hue & Saturation and Levels adjustment layers to their shapes and messed with colours and levels to blend them in with the surroundings a bit better. I decided to add a fake sun top right of the pic to add a bit of lighting drama and that was achieved by drawing a white circle, blurring it, adding a glow effect then using Filter – Render – Lighting Effects on the main Curiosity layer to shine a spotlight down from the suns location. With the light source firmly established, it was then time for some shadow. For any aliens that needed shadows, I duplicated the main alien layer, flipped the duplicate vertically, darkened & blurred it then used the Free Transform tool to mold the shadow to the required shape and angle depending on the light source. The middle, air born alien’s shadow cast over the rover was trickiest but it turned out ok’ish using a combination of simple Brush darkening, Displacement Maps and Layer Masking. I used Layer Masking again to make the middle alien appear to be behind the rover simply by erasing out his legs around the rover’s shape. Next it was time for some touching up on the aliens, mostly using a soft Brush on an Overlay layer with lowered Opacity to add shadows and highlights with black & white colours. I used the alien layers masks to fade out their edges a bit where the sun hit them, especially the middle alien. Finally I added a Photo Filter adjustment layer with a colour sampled from the Martian landscape on top of everything to bring all the composition together. Hope you like it. Click the final image below to view a hi-res version and don’t forget to zoom right in! Just thought I’d apply my old 3D (Stereoscopic, Red & Cyan) Photoshop technique to the latest photos coming from the Curiosity rover on Mars. It”s been for a spin and left some tracks! Obviously I couldn’t be there to take the proper pics you need to for creating 3D composites so I messed with perspective a bit in photoshop instead. Not quite as good but decent. NASA might need to look a little closer at one of those first images from the Curiosity Mars rover landed today. Might not have taken as long as expected to find life..LOOK OUT BEHIND YOU. 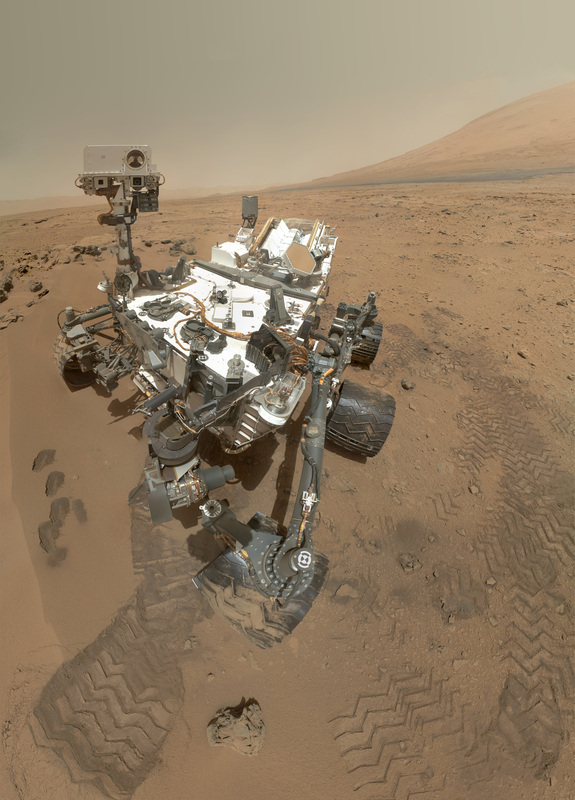 Posted on August 6, 2012 Categories Photo EditingTags alien, curiosity rover, life, marsLeave a comment on Curiosity? Careful..